My, the months seem to be flying past. It’s March and time for me to introduce our new artist of the month Daniel Vangeli. I had the pleasure of meeting Dan and his wife last year at the PWS exhibition. Dan is a fabulous but very modest person. 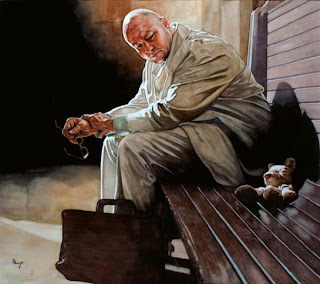 He has huge talent and has just won a major award at this years American Watercolor society 2012 exhibition with this painting. I know many of you are starting to enter juried shows locally and some are thinking of spreading their wings and trying further afield. So why not ask Dan about his experiences. First of all thank you so much for having me. When Ona asked me about sharing what I do, I felt honored, as well as inadequate. I have been painting watercolors for a little over 3 years total, with just finding a passion for it within the last 2 years. I had left painting all together several years ago, only giving watercolor a second try in 2010. Something just "clicked" for me this time, and I haven't stopped since. My first painting back was "Lost and Found", which is the painting above and is also the painting that has launched my career. In 2010 I entered my very first watercolor competition, the Pennsylvania Watercolor Society's International Juried Exhibition. 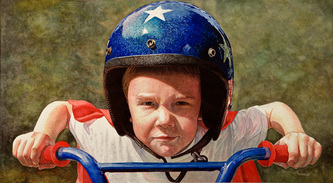 Not thinking much about having a chance in entering, my painting won first place. This gave me the confidence I needed to keep going, and over the last 2 years I've won awards at other societies, have had work published in a few magazines. Here are a couple more of my paintings. I look forward to sharing what I do know, and hearing from you as well. Thank you Joyce! Most of my inspiration comes from everyday people. Almost all of the people in my paintings are family and friends. I enjoy trying to show a little of their personality, and telling a story. Right now I am starting a series of paintings of people from my hometown area, and telling their stories. People I see everyday, but never had a chance to get to know them. Wow Dan! Your paintings are amazing What colours do you use to build up those gorgeous skin tones? And how do you prevent the shadows from becoming "muddy" looking? Great work, and thanks for being our artist of the month! As for skin tones, it varies with each piece. but most of the time I start with the rose madder, alittle aureolin yellow, and add a little olive green. It gets a nice base skin tone. I start very light, and build up from there adding scarlet lake, and cobalt blue to the mix. I wish I could demonstrate this. I use a large palette, and really use the mixing area to experiment until I find what I want. I will get those photos to you in the next day or two. I also am going to take a photo of my palette and show my skin tone mixing on it. I just finished my painting on Wednesday, and have gotten a photographer to take photos of it. I need to color correct them a little. Hi Jean, I too pretty much paint what I see. I have a graphic art background, so take all my photographs, and combine them using Photoshop on the computer. I will do all my alterations there, adjust colors, add effects, and do my cropping. Then I do a grid on the computer, and on my paper. I then I just draw grid by grid exactly hownit is. Then I actually paint from my computer, where I can blow up the sections I am working on. So all of the creative stuff happens on the computer first, the the painting is just what I see from the computer. 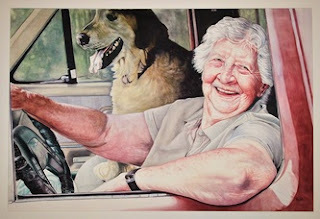 I love the painting of the woman in the car. What do you start with in a painting and why? I know some people do the background first and others the subject. some do a little of everything and build it all up in one go. With almost every painting I do, I start with the eyes, and then work my way around the face. There is just so much that can be expressed through a person's eyes. Once the face is done, I continue with the subject, doing the background last. Every person I have painted so far, I have gotten permission first. most of them are friends and family. I would recommend making a paper to have your "models" sign to give you permission to paint them. It haven't done this myself, but am going to be starting this as a practice. Especially if you intend on entering shows in the future. You never know sometime down the road, if someone will come back and say otherwise, causing problems. I hope this helps! Good luck with your paintings! to answer your other question, I take all my own reference photos,then Photoshop them together in the computer to get the final composition. I use a Nikon d3000 camera, which is Nikon's entry level digital SLR camera. Most of my paintings take between 60 - 100 hours. This includes the Photoshop computer work, drawing, and painting. On my bigger paintings: 4 - 20 hours photo shopping, 10 - 20 hours drawing, 30 to 60 hours actually painting. Thanks for the question!